CopySafe PDF is the most secure solution available if you want to copy protect PDF files. Currently it is the only solution available in the world that can protect PDF from all avenues of copy including Printscreen and screen capture. The CopySafe PDF Converter will protect PDF documents that already exists by including the CopySafe runtime and either produce an embedded viewer and/or a smaller PDF library file that can be read in the free CopySafe PDF Reader… ideal for distribution by download, email or on CD for Windows whether online or offline. When importing PDFs created by Adobe Acrobat that already have set password, expiry or watermark, those options are maintained in the CopySafe encrypted version. The CopySafe PDF Reader is available as a free download to the public, anyone that needs to view CopySafe protected PDFs. CopySafe PDF Converter is a licensed program that imports existing PDF files, encrypts them into library files that can be opened with the free CopySafe PDF Viewer. It is impossible to copy the images and text used in a CopySafe PDF document, even by using Printscreen or screen capture software. A password can be set at the time encryption to prevent unauthorized distribution. Without the correct password the document cannot be opened. An expiry date can be set after which the document cannot be opened. Of course this is optional and expiration does not need to be set. Printing can be disabled at the time of conversion, or you can leave it enabled to allow printing. The CopySafe PDF Converter will import any existing PDF document and encrypt it into a single archive, preventing the extraction of its components, source code and password (if one is set). You can now distribute text documents that cannot be reproduced at all. You can now send images and drawings to clients that cannot be copied. You can also password protect or set expiration. 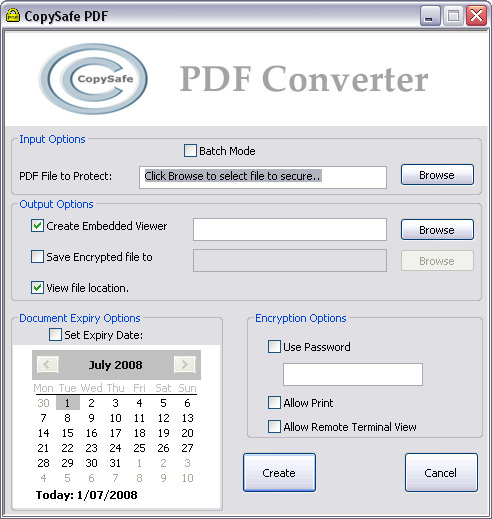 The CopySafe PDF Converter can create a standalone Viewer/PDF executable or create a library to be read in the CopySafe PDF Reader. To view a CopySafe PDF executable all you need to do is double click the file. It includes its own viewer and does not require anything more than Windows. To view PDF libraries (.enc) you can use the CopySafe PDF Reader which is a free public download. CopySafe PDF documents can be scrolled from page to page, zoomed in and out, and rotated in either direction. Simply copying the viewer executable to a new computer will not work. The original installer as provided in the free download must be used for it to function properly. More information on price and how to order online can be found on the CopySafe PDF home page. CopySafe PDF is for converting normal PDF documents to a protected format that can be distributed and viewed offline. To copy protect your web site please see CopySafe Web which will copy protect almost all content that can be displayed on a web page.